There's nothing like a good YA romance-ish novel! I just finished Wolves, Boys, and Other Things That Might Kill Me by the very talented Kristen Chandler. I can say I knew her when. . .how many BYU writing conference classes were we in together? I'm always thrilled to see fantastic writers I know get published. And equally thrilled that it gives me a swift kick in the rear to get querying again. Sigh. But yes, run get a copy. Well written, very funny, great setting, fantastic characters. Love, love, love it. 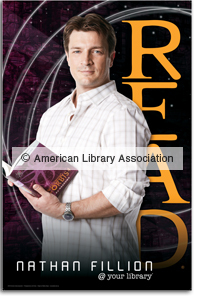 And there's also nothing like a good celebrity "Read" poster from the ALA! My good friend (and fellow Firefly fanatic. . .sorry Holly, introducing you to it was for your own good) found this new gem on the ALA website. I bought it. For the kids. Of course. No way would I just hoard it in my office and imagine Mr. Fillion saying, "Yes, I've read a poem. Try not to faint" as I catalog books. Good choice, ALA. DRATW.